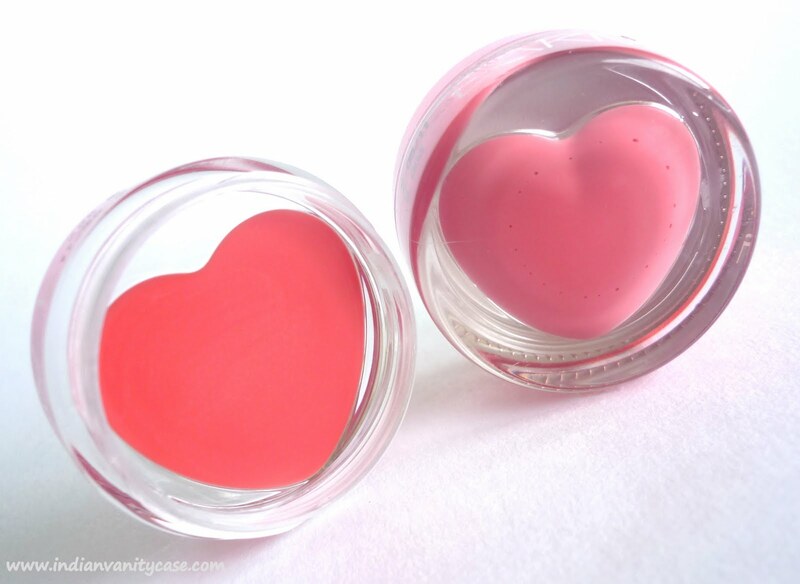 It’s a gel-based lip softener that promises to pamper your pout with color and moisture. Lip Love Conditioner contains Shea butter and Jojoba oil to hydrate your lips while the SPF 12 protects your lips from the sun. Lip Love Conditioner is extremely light-weight and is loaded with the goodness of Shea butter; Jojoba oil and high shine polymers. Available in 4 shades ~ Hottie, Flirt, Charmer, Siren. I'll be showing you Flirt & Charmer. 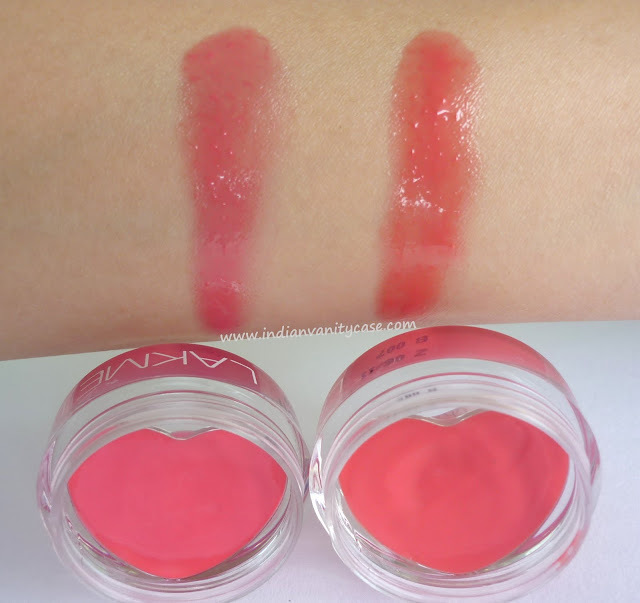 They look quite similar in the little jars, especially when they're new, but Flirt is pinkish, and Charmer is sheer red. I am very impressed these! They smell delicious- like vanilla, and they make my lips really really soft & supple. And most important of all, the packaging....oh my bows, the packaging! It is one of the cutest lip balm jars ever! Heart-shaped from both top and bottom. I L♥VE! Talking about MAC Tinted Lip Conditioner, I am guessing Lakme LLC was inspired by it. If so, then I'm so proud of Lakme for kind of nailing it. The texture... the smell- almost ditto. 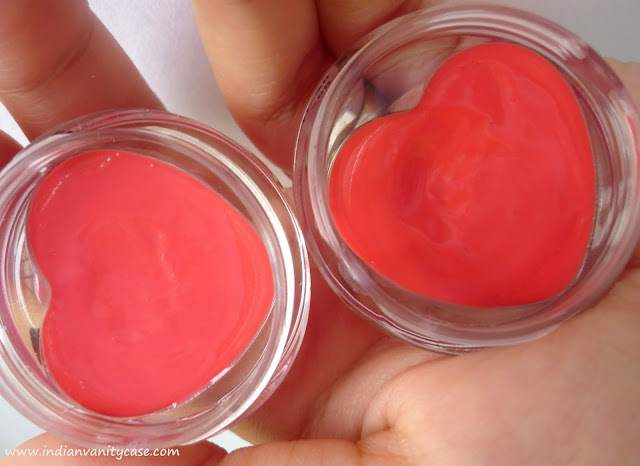 So if you're looking for a MAC TLC dupe, you might want to check these out. 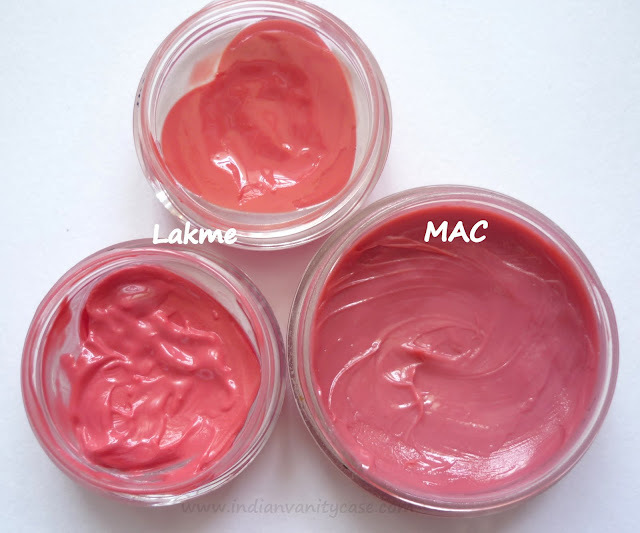 A few differences: Mac TLC is more balmy & Lakme LLC is more glossy, Mac TLC has SPF 15 & Lakme LLC has SPF 12, Lakme LLC is more glossy & Mac TLC is more balmy. Let's compare prices, shall we? 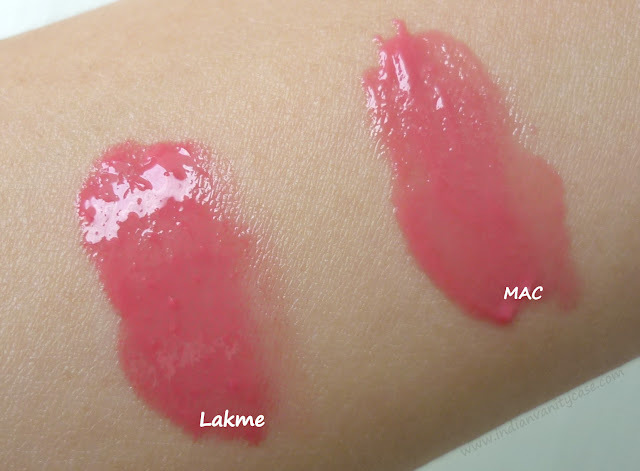 Now back to Lakme Lip Love Conditioner ~ As a lip balm addict, I adore them! Cute packaging, delicious content & my lips love them (or they love my lips?) I'm definitely buying more. Disclosure: Products sent by PR for consideration. All opinions are my own, as always. I am not paid to write this post. To know more, please read my Disclosure page. Adorable! Will have to check these out next time I'm in Bangalore! charmer is calling me!! but i guess i can't go! bcoz i decided to stop buying form companies which does animal testing. So how do you compare these to sleek's pot polish? great review and thanks for the comparison .. Lakme products are not available in Pakistan ..!! i would love to try them .. I love the colors, but i've always found potted balms like that too messy. x_x Somehow stuff always gets stuck under my nails. I shall defo stock up on these when I visit India! :D I have never bought MAC TLC's only coz I can't justify its price. hi Cynthia,I have been a silent reader here. but am so impressed with this post so could help rather commenting.. I bought charmer last week. U r true its very creamy and glossy. since I dont have access to MAC store at my place, dont know about the MAC stuff. but am so impressed with this post so could'nt help rather commenting.. This is SUCH CUTE packaging!! I'd definitely keep these containers after I'm done with the product ^^ It looks like a really close dupe to MAC's too!! Reez, it's so sweet & kind of you to say that. Thank you so much for appreciating my blog.